Justin Cazimero-Chinen, left, Dianna Wong, Ho'okele Kalilikane and Taylor Silva work on a back bridge during a yoga class at Jarrett Middle School. Yoga is teaching students at Jarrett Middle School how to relax, find inner peace and power, and alleviate anxiety and worry. For information on teacher training or implementing youth yoga programs, call Brynne Caleda, 753-2856; e-mail brynne@brynnecaleda.com; or visit www.brynnecaleda.com. Caleda also teaches a class that includes adults, 6 to 7:15 p.m. Tuesdays at Jarrett Middle School. 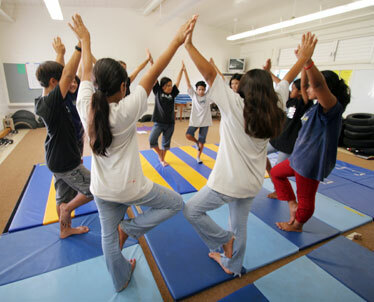 Yoga for Kids: 2:30 to 3:15 p.m. Sundays, Manoa Yoga Center. For ages 6 to 11. Call 927-1348 or visit www.manoayoga.com. 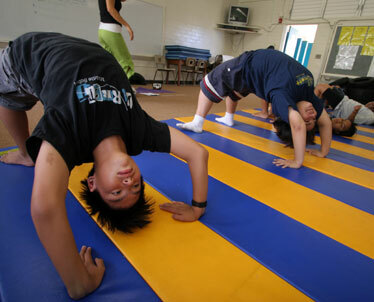 Yoga4Ewa: 4:15 p.m. Wednesdays for ages 10 to 13, 10:45 a.m. Saturdays for ages 6 to 9, in Ewa Beach. Pre-registration required. Call 689-1020 or visit www.yoga4ewa.com. Purple Yoga Hawaii: 3:30 to 4:30 p.m. Mondays and Wednesdays. For ages 5 to 9. Call 944-8585. Jasmine Yoga: Call 561-9639 or visit www.jasmineyoga.com. "Kids today are faced with so many challenges," said yoga instructor Brynne Caleda. "Sometimes during rest poses, I'll see them cry." Caleda began teaching yoga classes at the middle school two years ago, implementing yoga into the after-school program for her master's thesis. She plans to train schoolteachers to teach yoga, and she is working with the Department of Education to get yoga in more local schools. Shortly after Caleda finished her yoga teacher training, she was accepted into the graduate program in education at the University of Hawaii at Manoa. "I realized that yoga would be a wonderful complement to the hectic lives of children, and (there is) no better way to implement yoga than in school." Seventh-grader Hi'iaka Kalilikane has been taking the class since last year and says it makes a difference. "It makes me feel good, light and relaxed. It helps get rid of your problems for a little while." Taylor Silva is new to the class but has already experienced benefits. Once balance is achieved, she says, it is easy to relax. "I may be having a bad day with all the stress inside but can get it out by doing yoga." Brynne Caleda leads the class in a yoga pose. Behind her are Ariann Nanny, left, and Hi'iaka Kalilikane. Caleda says yoga helps youths deal with the social stresses of this age, along with increasing flexibility. Justin Cazimero-Chinen is feeling stronger and more flexible these days. The eighth-grader began taking yoga classes two years ago during an after-school program at Jarrett Middle School. "Lot of kids think it's going to be a drag, but they try it and really like the poses," he said. "I like some of the poses because they are challenging. After a while it is really fun to do." During a recent class, instructor Brynne Caleda's theme was balance -- what is balance, how does it feel and how balance or lack of it affects us in life. Students related to the idea of losing balance when they get bad grades or have a fight. Basic yoga rules are listed on the board: Follow all directions; be mindful of space; respect the safety of others and yourself; be kind, honest and respectful; just have fun. Young participants develop a sense of their bodies and the way their bodies move. Attention span is improved, and they become stronger and more flexible, Caleda explained. Yoga instructor Brynne Caleda leads a class at Jarrett Middle School in a stretch. The young students say they see the results in strength and flexibility. Seventh-grader Trevor Tollefsen's his first class provided a positive experience. "I really like the butterfly pose, and I liked resting, too," he said. Preconceived notions need to be set aside. Many people view yoga as a religion or type of meditation. "Some parents may think that their kids are twisting in weird and different ways," Caleda said. "Personally, I feel children need yoga just as much as adults. Children today live in a fast-paced world of busy parents, school pressures and competitive sports," Caleda added. "We usually do not think these influences are stressful for kids, but they are." Yoga from an early age can enhance flexibility, strength, coordination and body awareness, she said. "In addition, their concentration and sense of calmness and relaxation improve. In yoga, children exercise, play and connect more deeply with their inner self." Mara Pike, owner of Jasmine Yoga, agreed. "Young children are resilient, creative and playful. Taking time to sustain these qualities allows children to interact with others their own age in a cooperative environment," Pike said. "Yoga builds strength (and) teaches injury prevention and self-discipline." Pike added, "There is no underlying religious component. This tradition of movement and breath is a mind-body exercise where the individual is asked to tune in to their own bodies in space, their own emotions and express themselves in a constructive way." The students gather in a circle in a tree pose. Seventh-grader Ho'okele Kalilikane has attended Caleda's class for two years and continues to maintain increased flexibility. "I like it because I didn't realize how flexible I was until I did the splits," she said. Ariann Nanny, another seventh-grader, has only been taking yoga for a couple of months. "I've learned how to keep my balance and feel relaxed." The class hosts a wide range of personalities. "I have the tough kids and the shy ones," Caleda said. Because the class is not mandatory, "the mood they are in" determines who shows up each week. "Yoga is often confused as something you do to stretch and meditate. Children often think that sounds boring," she said. Her classes promote exercise and play. "The boys are really engaged because many of the postures require strength and stamina, two things most young boys are working to increase." Caleda recently reviewed the journals she kept while attending middle school. "Working through that stuff helped me relate with these kids," she said. "I didn't realize I was still carrying these things around with me."